In John Curran’s latest drama/thriller “Stone,” Robert De Niro plays Jack Mabry, a corrections officer thisclose to retirement. But before he can retire, he takes on the case of Gerald “Stone” Creeson, played by Edward Norton. Stone is in prison for covering up the murder of his grandparents with a fire. Stone is also thisclose to getting out of jail, and he obviously needs Jack’s help to do so. Needing to convince Jack he is reformed, Stone decides to throw his beautiful wife Lucetta (Milla Jovovich) into the mix by having her get close to Jack. What starts off looking like a plan devised by both husband and wife, Lucetta successfully seduces the married Jack. But from the trailer, it looks as if Stone starts to seem weary of his plan as Lucetta seems to be getting a little too close to Jack. Stone tells Jack that he shouldn’t trust Lucetta, and she says the same about her husband to Jack. With all the mind games and tricks, who should Jack believe? Will his wife find out? And will Stone get paroled? The trailer is perfect in leaving the viewer wanting to know the answers to these questions. What especially makes the trailer is the amazing performance by Norton. He completely takes on the character of Stone in the way he moves and talks. 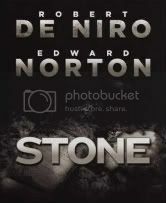 Could Norton be a possible Oscar contender with his performance in “Stone”? We’ll have to wait and see. See “Stone” when it hits theaters on Oct. 8. Norton is a natural at taking on different and distinct personas, ever since his performances in Rounders, American History X and Fight Club I have been a fan of his work. Not to mention the great Deniro and Spaceck. Going to check out this movie for sure!